Carl Homstad has been painting murals for more than thirty years. He has painted more than forty large outdoor murals throughout the Midwest. He has also supervised over one hundred murals in schools. 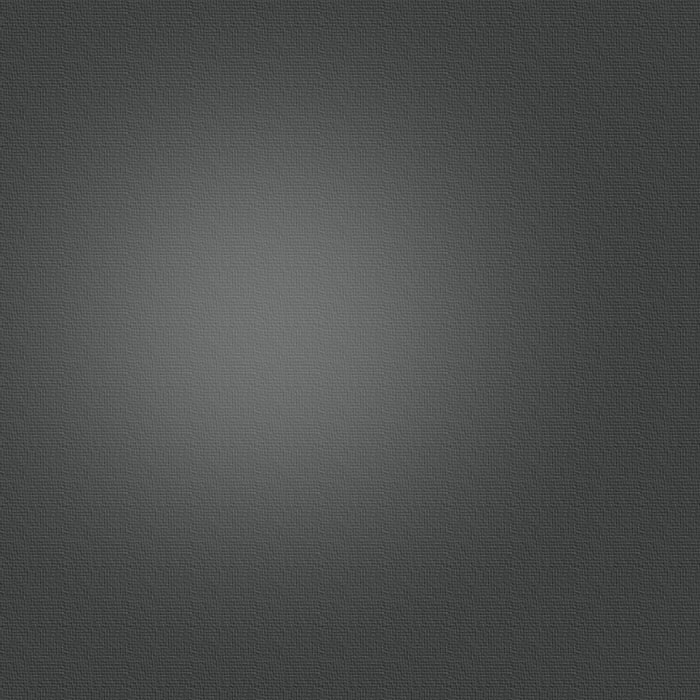 Please scroll down. Marshalltown , circa 1920 © Homstad 2011 30'x150' .Painted in 16 days. 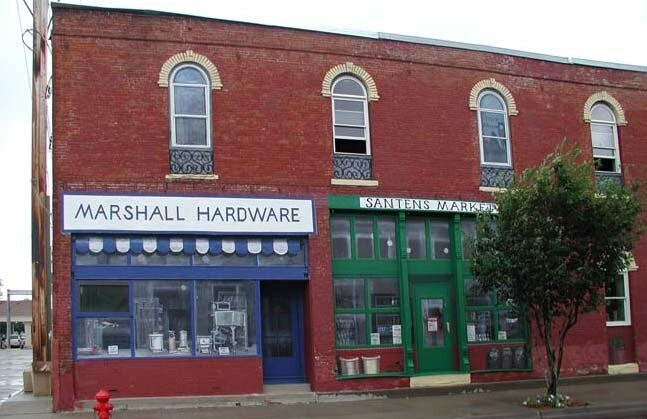 These are store fronts in Marshalltown, IA that no longer exist. Chautauqua Building, Sac City, IA, © Carl Homstad 2007, 14'x80'. Painted in 10 days. This mural celebrates the centennial of the Chautauqua building, built in 1908. Then and Now, Osceola, IA, © Carl Homstad 2007, 14'x80'. Painted in 15 days. This view is of some buildings that used to be in Osceola, and some that are still there. Stores, Newton, IA, © Carl Homstad 2005, 12'x50'. Painted in 8 days. This mural shows old stores painted on empty storefronts. Newton Printshop, © Carl Homstad 2005, 20'x40'. Painted in 7 days. This view is of an old printshop, because it is painted on a newspaper building. Welcome to Newton Iowa, © Carl Homstad 2003, 36'x80'. Painted in 10 days. This view includes some of Newton's architectural details. The Delta Queen, Guttenberg, IA © Homstad 2012. 40’ x20’ Painted in 5 days. Maytag Dairy Farm, Newton, IA, © Carl Homstad 2004, 30'x135'. Painted in 10 days. This is where they make Maytag Blue Cheese. The Garden, Hotel Winneshiek, Decorah, IA. © Homstad 2000, 7”x14”. Painted in 6 days. This is a painting of the owner’s garden. 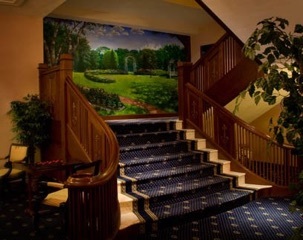 Blue Grass Palace, Creston, IA, © Carl Homstad 2002, 12'x24 ', Painted in 10 days. This Mural shows the Blue Grass Palace that was a temporary exhibit hall made of hay in the early 1900's. 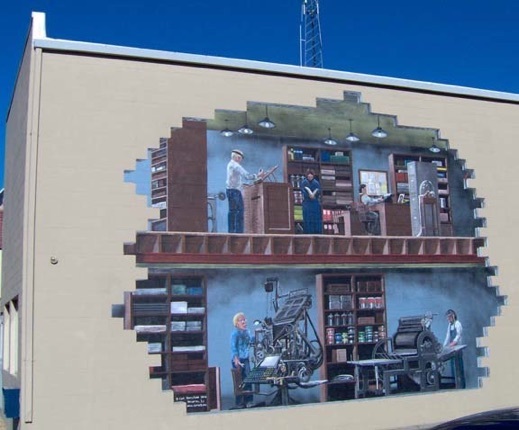 Huron, SD, Mural, © Carl Homstad 2000, 23'x107', painted in 10 days.This is a view of Downtown Huron in about 1940. 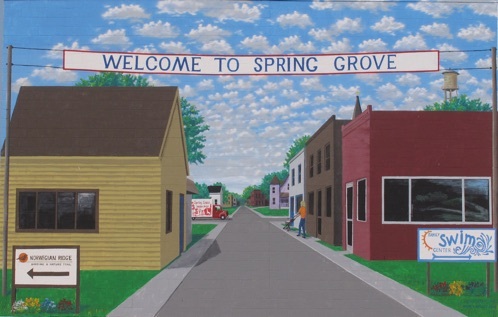 Jefferson, IA, Mural, © Carl Homstad 1976, repainted 200036'x133'. Painted in 15 days. This is a view of Jefferson from about 3 miles out of town. This is a view of a resort on the Cedar River from about 1905. The Old Depot, Calmar IA, © Carl Homstad 1990, 14'x40'. Painted in 10 days. Repainted 2012.This is a view of the old Depot from about 1910 before it burned down. Water Street, circa 1888, Decorah, IA, © Carl Homstad 1988, 8'x20'. Repainted 2016. Painted in 5 days.This is a view of the street from the same spot 100 years earlier. Threshing Scene, Decorah Senior Center, circa 1935, © Carl Homstad 2000, 70'x18'. Painted in 12 Days. Norway Baseball, Norway, IA © Homstad 2013. 20‘x10’ painted in 4 days. Welcome to Britt Iowa, © Homstad 2013. !2’x 80’ painted in 10 Days. A view of the main street in Britt circa 1950. Notice the Hobos on the right side. Nordic Fest Parade, Decorah, IA, © Homstad 2013, 10‘x115’ painted in 7 days. This is part of the parade that happens each year during the Nordic Fest, Decorah’s annual celebration, the last full weekend in July. 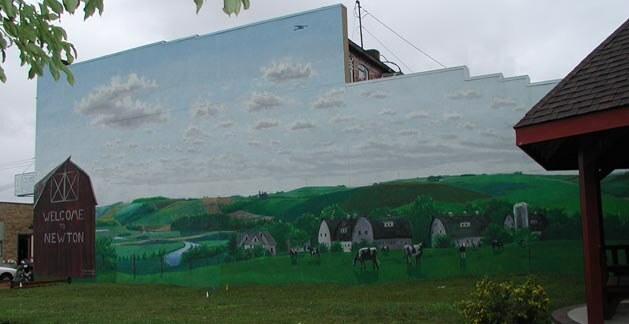 Chamber of Commerce Mural, Decorah, IA, © Homstad 2014, 11‘x15’ painted in 5 days. 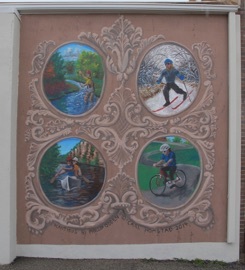 This mural shows outdoor activities available around Decorah in each of the for seasons. The pictures are in a simulated acanthus carved frame designed by Philip Odden. Manchester Iowa, © Homstad 2015, 63‘x12’. painted in 9 days. Medieval Courtyard, Newton IA, © Carl Homstad 2009, 14'x60'. Painted in 15 days. Sumner City Park, Sumner Iowa, © Homstad 2016, 24’ x120’. Painted in 9 days.